There’s an art to being homeless. Before you think I’m being crass or facetious, please hear me out. I’ll say it again. There’s an art to being homeless. What do you mean Liz? Well, to say there is an art to anything usually implies a certain giftedness, or skill set requirement, an element of uniqueness that is distinctly yours. How would you know Liz? You’ve never been homeless. You’re right. But very recently I got a two day bird’s eye view of what it’s like when I decided to make the “plight of just one” my business. I decided to get personally involved. To not just toss a few coins in the Salvation Army pot, take my Tootsie Roll and get a warm fuzzy feeling that I’d done something good today. I decided I would try to help someone. Without a plan. Without a guidebook. You know what? It was really scary. That’s because there are real lives involved once you decide to personally try to help. Let me tell you what it’s like for the person affected by homelessness in the small 48 hour window of time that I observed. You go to a shelter, and the first thing they ask you is do you have a current ID card and are you a member of this county? If not, good luck. Then they tell you this cold truth: They are currently full, but kindly give you the names of other shelters and/or food pantries and their address and phone numbers. OK, that’s great and all, but what do you do if you have no ride, no money for bus, and no cell phone to find out how to get there? What are their requirements to get in and how far are they from this current shelter? Chances are if this shelter is full, the rest of them are too. My friend had a ride—me. But the others? Where/how do they go from here? So we continued on. The next shelter told us to come back the next day but with a small warning. We were told that right now in my home city (Raleigh, NC), “There are over 300 men, women, and YES—CHILDREN who do not get into the shelters each night because they are full.” Homelessness is still a big problem every night, not just the rare nights around the holidays when it gets more media attention. It’s harder still in the winter. All of our local shelters have a lottery system to get in when they are full. Those who provide longer term shelter needs and/or rehabilitation services have counselors who are truly angels and have the impossible task of deciding who gets in the program and who doesn’t. Women and children take priority. But this impossible task leaves many people at risk, especially men. Where do you sleep tonight when you are bone weary from walking all day and your stomach still growls? You can’t sleep in parks or public places because that is against the law! It doesn’t take long for the police to tell you to beat it or else get arrested for loitering, or trespassing. Basically the first rule of homelessness? KEEP MOVING. At one shelter, I asked on behalf of my friend, “Then what do you do if you don’t get in tonight?” “Well, there’s the woods” we were told. This was not said to us in a mean spirit, but in a hard-hitting dose of truthfulness. There’s no worse moral dilemma than knowing you can’t (or perhaps shouldn’t) take someone you barely know home with you because the process of rebuilding a life and rehabilitating from the crisis that brought them here is even more time consuming and complex than finding a place to stay for tonight. You have a life, a job, and a family too. This is not an “overnight” project. Often there are mental health issues. These are made worse by erratic access to meds, or else inconsistent compliance in taking them. Shelters can be noisy at night, there are varying temperaments and people of all degrees of physical and mental health sleeping mere inches from you—that is, if they sleep. Yes, homelessness is a fine art. Being street-wise requires a skill set that those used to permanency in terms of residency don’t usually possess. You have to know which trash cans have the freshest and safest food. You have to learn to travel light and which areas to avoid so that your precious few possessions or whatever money you’ve scrabbled together or begged for won’t be stolen while you sleep near other homeless people. You can’t loiter. If you a black man, (even a non-homeless man), don’t be surprised if you are assumed to be loitering even if you are just resting on a public bench or waiting under a bus shelter. Prepare to be questioned by authorities as to why you are here, and be prepared to show some identification. If you admit to being homeless, get ready to move….again. It’s all very exhausting. And you know what? It’s depressing too. Perhaps after several weeks or months, you’d be tempted to drink too. Or worse. Would I be to tempted to steal if I was desperately hungry? Probably. You don’t know until you’re there. “Well, why don’t they just get a job?” those that have no clue say. Yeah, right! You see how easy it is to get a job with no resume in hand, no permanent address, no phone to be called back on, no interview clothes, no consistent access to getting a clean shower! An ever-diminishing trust and increasing rejection deteriorates relationships with those that once loved you but can’t understand how you got in this predicament to begin with. You become more and more invisible as your dignity slowly seeps away. People begin to not see you. They forget who you were. Uncomfortableness makes us turn away. My story ends happily, but not without a lot of very tense and scary and unpredictable moments. It ended with the way it began. It started with a prayer being uttered most fervently and was answered most magnificently because God is good. The next day my friend was accepted into a long-term residency program at a local shelter. It was a miracle because we were told only 1 in 30 get in. So does God care about the other people too? Of course he does. So why doesn’t He help them too you may think? I can’t speak for God but perhaps He is waiting for us. Waiting for us to do what you ask? I will tell you very soon in part two of this story. Meanwhile, when you give thanks for your supper or your home tonight, say a prayer for the sometimes invisible man, woman, or child on the street who desperately wants life to be different than this. Many are here not because of bad choices or only because of them. Circumstances do play a part. Pray for their safety and their physical and spiritual needs to be addressed and met. Pray that our economy recovers in a meaningful way. Pray that you can find both time and resources this Christmas to help in even small ways such as dropping off canned goods at a food bank location, getting a gift for an angel on an angel tree, and by all means put those coins in the Salvation Army pot. I believe our God is all about second chances, but that can’t happen if we don’t play our part. 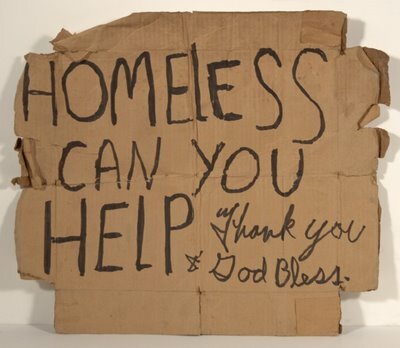 Together we can all make a difference in the lives of the homeless. Would love to know your thoughts on solutions for homelessness. This entry was posted in Homelessness and tagged Homelessness by Liz Gray. Bookmark the permalink. I remember that day all so well,it was when I put my trust fully in God.The help I received from you helped me to becoming a better man. You already had it in you; I did nothing. But God started a good work in you, and He will not stop until He finishes it in Christ Jesus! I am so proud of you and pray all is well with you and your family! It is so good to hear from you! Gonna write you a private msg. in just a bit here!